We are just about out of our Minnesota winter and with the snow almost gone many of you and your children are already feeling your seasonal allergies starting up again. That all too familiar itchy eyes, watery nose and sneezing will soon be back in full force. There are many things you can do to help alleviate your child’s symptoms whenever their allergies start up. The simplest way to help is some environmental controls. 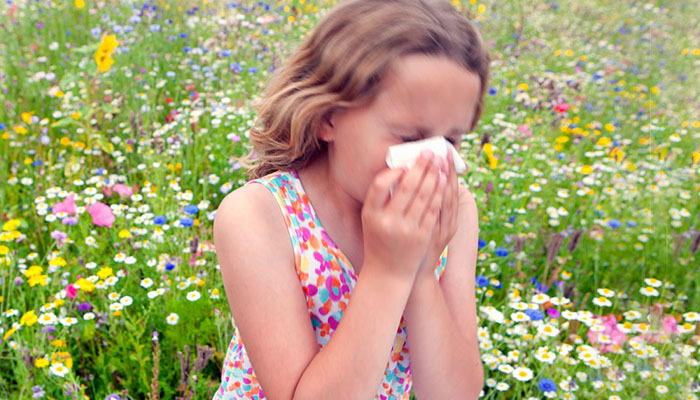 If your child’s symptoms start up when the flowers start blooming and the grass gets green then it is wise to keep the windows closed in their bedroom and perhaps the whole house to keep the allergens outside. Changing your house air filter on a regular basis can keep the allergens to a minimum and when the kids are in for the night it would be time to get them out of their outside clothes and into the tub to wash away the allergens. For older kids, washing up every time they come in including their face can be beneficial. Year round allergies are a different kettle of fish, if that is an issue for your child, please don’t hesitate to call for an appointment to help figure out the best steps to take. If your child’s allergies are just not controllable with the items mentioned above there are medications that can help out. Up until 2002 most of the medications were by prescription only but gradually more and more of them have become non-prescription. Now you have many options to help your child with their allergies. There are over the counter eye drops you can use if the symptoms are mostly itchy, watery eyes (Naphcon-A, Zaditor), nasal sprays to use if the symptoms are mostly sneezing and itchy nose (Flonase, Nasacort) and then oral medications if there are more symptoms or if the symptoms can’t be controlled by the above. Those oral medications include Benedryl, Zyrtec, Allegra and Claritin. All of the oral medications can have a side effect of sleepiness which is usually minimal and will typically go away. There certainly are prescription medication which could help and perhaps even a referral to an allergist if the allergies are really interfering with you and your child’s happiness. You can always make an appointment with your doctor or nurse practitioner to discuss allergies and other options which may be available for you. We can be reached at 952-401-8300.